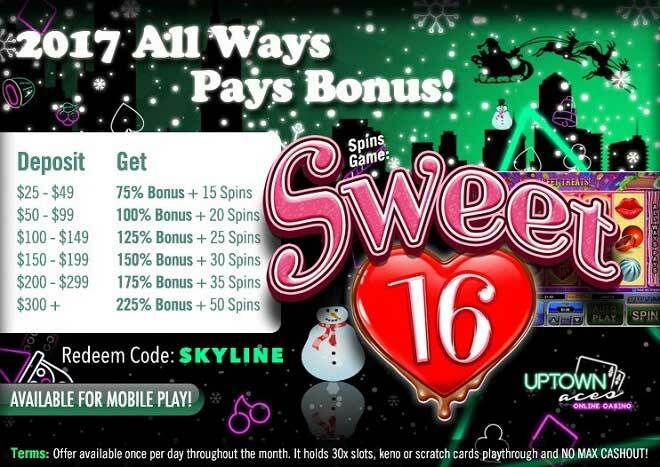 Here’s a fun filled way to celebrate the arrival of the New Year Uptown: join the party and help us celebrate our sweetest slot yet Sweet 16! Forget about a modest-type event, this over the top party is one you’re not going to want to miss out! Say hello to 2017 while spining this All Ways Pays slot where 243 winning combinations await! You’ll be collecting wins as easy as candy with the scatter lollipop and the Sweet 16 symbol becoming some of the sweetest winning treats you’ll find online! Deposit as little as $25 twice per day throughout the month of January and 2017 wins will start dripping like honey with a daily 225% Bonus + 50 Free Spins!